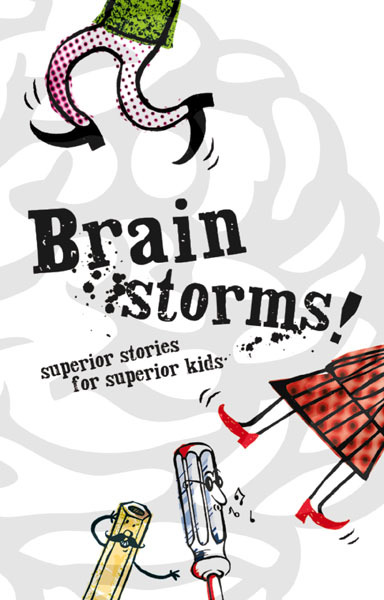 Home » Kids books » Brain Storms! One of the most enjoyable jobs I’ve had so far. This book showcases writing by kids for kids, aimed at the primary age group. These fantastic short stories are some of the finalists from the Nestlé ‘Write Around Australia’ competition, run between 1994 and 2005. Each of these young authors were mentored by an Australian children’s author, who helped them to polish the work into a final draft. The design brief was completely open, so I chose to emphasise the humorous and surprising aspects of many of the stories. The grey watermark of the brain on the cover represents a spot UV varnish. Cover design and illustration + 11 double-page black and white internal illustrations + smaller illustrations scattered throughout.